Okay, so it's really Hellfire and Rhinestones, but I thought that the "holiday refreshments will be served" after the fiery description of the evenings offerings was very funny. Light Industry is staying on the fringes of the season with their December 2nd presentation. On that Tuesday, at 8 PM, for $6 at the door, you can see items that celebrate the golden age of televangelism as curated by Leah Churner. 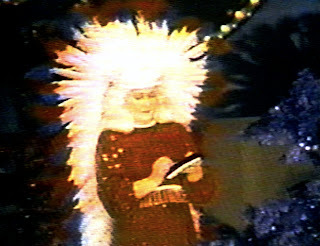 Werner Herzog's God's Angry Man, Christmas in America (from which the photo comes), and footage of "piano man Jimmy Lee Swaggart, who styled himself as the antithesis of his cousin Jerry Lee Lewis, and became the subject of an Ozzy Osbourne song in 1988." All that and holiday refreshments. Anyone want to babysit two under-twos?